Images above © Ethnographic Museum of the Radom Region, Poland. 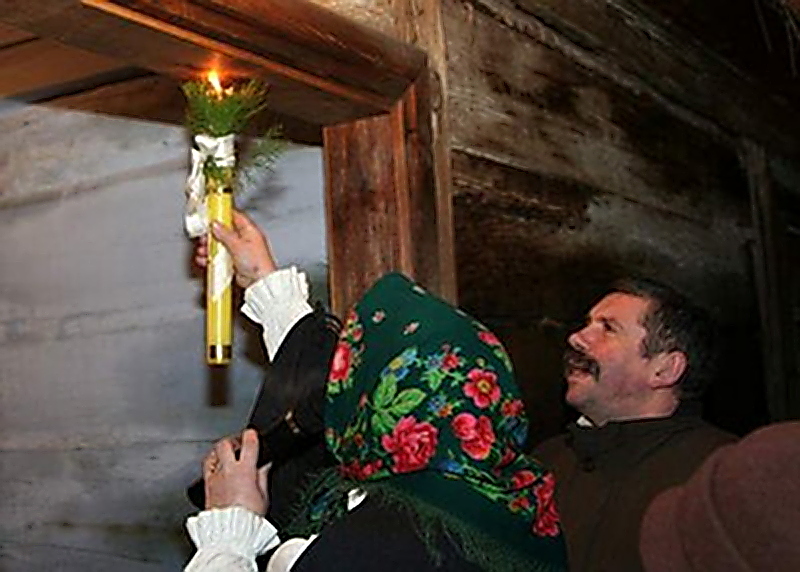 Rural celebrations of the Candlemas Day in Poland show remnants of old-Slavic protective rituals conducted with use of a gromnica (the so-called ‘thunder candle’). The Candlemas Day is celebrated on February 2nd, and marks the end of a carnival (’zapusty’ in Polish). That day is also officially the last day of a ‘Christmas season’ in Poland and the last occasion to sing the traditional carols together – also the day when all the remaining Christmas decorations should be removed (yes, in Poland the Christmas trees are very often kept in houses even until February). That day has a distinctive name in Poland, connected to ancient Slavic beliefs and rituals: Święto Matki Boskiej Gromnicznej, what could be translated to English as a ‘Festivity of the Holy Mother of the Thunder Candle’. The important symbolic accessories connected to this holiday is the so-called gromnica (plural form: gromnice), sacred candles believed to ensure a general protection. Name of these candles is derived from the word grom (thunder). These candles are long and relatively thick, often decorated with religious inscriptions and images. In many Polish folk beliefs gromnica is compared to a human, and its wick to a soul. It’s believed that gromnica symbolizes the light of life, and the triumph of soul and mind over body and flesh. Each Christian household in Poland has at least one of the ‘thunder candles’ stored carefully for this holiday and other special occasions. They are always lit up for the most important ceremonies such as Christening, First Communion, Confirmation and Anointing. They are also lit up by a deathbed during a vigil (czuwanie). Gromnica is very often a ‘personal’ candle: first gifted for someone’s birth or a Christening ceremony, protecting them throughtout the lifetime, and being lit up for the last time during their funeral (details of the custom depend on the region of Poland). It is said that gromnica ‘dies’ along with its owner, and it’s sometimes put into the coffin. The candle should be brought to churches each year for the Candlemas Day in order to be re-blessed (recharged, we might say). The ‘thunder candles’ have also much older old-Slavic meaning. For example, they are commonly believed to ward off the lightnings during storms (that’s in fact where their name comes from) and to protect from destructive wildfires. An ancient custom is to light the gromnice and place them on windowsills as a protection of the house during storms – it is still widely practiced in Poland, especially by the elderly people. People believed also that the ‘thunder candles’ were a protection from an attack of wolves – a small part of the candle was often buried in the middle of a crop field in order to keep the whole property safe. A small part of the gromnica was sometimes buried also under foundations or tresholds of a newly built house in order to ensure its safety. In the past the ‘thunder candles’ used to be made of natural beeswax only, with a wick made of fibers of verbascum. Polish people believed that the honey aroma of the natural beeswax has a strong healing effect – strengthening the soul and immunizing the body, protecting people. Verbascum was one of the most sacred herbs in the Slavic traditions, still important in rural rituals and medicine, and in the past it was dedicated to the old-Slavic goddess Dziewanna / Devana. In the Polish language this herb is still called ‘dziewanna’ – exactly like the goddess. According to Polish folklore verbascum symbolizes the triumph of mind over body – it’s the root of the symbolism of the ‘thunder candles’ mentioned above. The ‘thunder candles’ have lost the link to the Slavic paganism completely though, and is only rarely revived by the Rodnovers (believers in Slavic Native Faith) in Poland. Gromnice became incorporated into the Christian traditions in Poland as the sacred candle of the Holy Mother. In the context of the Candlemas Day, it’s dedicated to the Holy Mother as a patroness of the commoners/villagers and of the people threatened by wolves There are many Polish folk legends that describe the Holy Mother as a ‘Maiden protecting from wovles’ (read more about it here). People decorate the ‘thunder candle’ for a special holy mass organized most often in the late afternoon or evening on the Candlemas Day. The candles are adorned with fir twigs and light blue ribbons (light blue being the symbolic colour of the Holy Mother), and then bring them to the church in order to get them blessed for the following year. The rest of the custom is slowly fading away and surviving only in some villages and small towns in Poland. It was believed that the gromnica that was blessed in the church was bringing a ‘blessed fire’ home that day, and it was important to keep it lit up during the whole way back from the church. If the fire of gromnica ‘died’ on the way despite favorable weather conditions, it was said that it predicted death of someone in the family. Right after returning home from the holy mass the oldest person in the family was ‘safeguarding’ the doors and windows with fire and smoke of the gromnica, making sign of a cross and other symbols. Head of the house was visiting each building on the property, including all the barns, stables and warehouses, to incense them and drop a little bit of the blessed wax onto all tresholds to protect the buildings from evil spirits and misfortune. Then the ‘blessed fire’ was used to start a fire in stove and the fir twigs were burned in it. In some regions of Poland people were also burning a cross sign on the underside of the main construction beam or a door frame inside the house (see below). These customs used to belong to the first steps of the old-Slavic rites of the invocation of spring in anticipation of the spring equinox. However, this day is also commonly associated with the notion of a ‘halfway of winter’. The Candlemas Day as a Day of the ‘Thunder Candle’ is connected to numerous Polish proverbs. In majority of them the weather conditions on that day are used to predict weather for the upcoming months. My general list of resources and book recommendations [in Polish only]. Have a question? Want to know more about certain details? Feel free to use the comments section below! Names with the root ‘grom’ are very interesting. The word grom alone can mean either a lightning bolt or a thunder clap, depending on a context. In the common speech, the word grom is used as a synonym for an angry warning or reprimand. There’s also a verb ‘gromić’ which means to inflict a defeat on the enemy / distract and crush them. Either way, it is quite a ‘strong’ word.